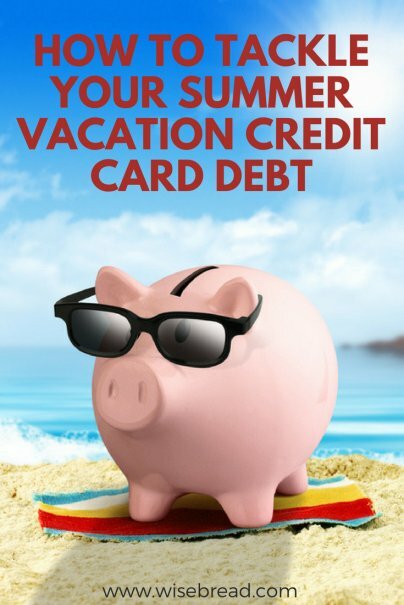 It's easy to rack up credit card debt while on summer vacation. After all, finances are probably the last thing on your mind, and you have a handy credit card in your wallet whenever you need something. You can sit back with a margarita in hand without having to look at that credit card statement until next month. When summer comes to a close, however, it can be quite a shock to see how high your credit card balance has grown. It's not a fun situation, but with a plan in place, you can get out of credit card debt before the snow starts to fall. Here's how to do it. As tempting as it might be, now's not the time to hide your head in the sand. In order to create a plan to get out of credit card debt, you first need to know how big of a monster you're fighting. What the interest rate is. It's a good idea to check in with your budget again if it's been a while. In this case, it also serves another purpose: Finding out how much extra you can afford to pay toward your debt each month. Go through each line item and ask yourself if there's any way you can reduce it without sacrificing too much. For example, do you really need to pay for cable if you're mostly watching Netflix, or can you start bringing leftovers for lunch instead of going out to pricey restaurants? Cut those corners now and it could make a huge impact in your debt repayment plan. After you've gone through your budget and found extra money, it's time to commit to a monthly payment amount. If at all possible, strive to pay more than the minimum monthly payment amount for your credit card debt. The more you can afford to pay each month, the sooner you'll be out of debt. If all of your credit card debt is on one credit card, this'll be easy: pay off that credit card and you'll be done. But what if your debt is scattered across two or more credit cards? In that case, you'll need to make the minimum payment on each. If you have money leftover after making the minimum payments, you'll need to decide where to send it. Two popular debt-payoff methods are the debt snowball and debt avalanche methods. The debt snowball method has you paying off the credit card with the smallest balance first, then moving onto the next smallest balance. The avalanche method is similar in execution, but instead of starting with the card with the smallest balance, you start with the card with the lowest interest rate until your debt is gone. So, you've committed to a monthly debt payment that is hopefully higher than the minimum required. This will get you out of debt on schedule, but wouldn't it be better to get out of debt even sooner? That's why it's a good idea to throw any extra money you have coming in toward your debt. If you earn any money from a side hustle, selling unwanted items, unexpected gifts, or a raise at work, throwing it at your debt rather than buying a new big-screen TV can go a long way toward getting out of debt sooner. In order to avoid a repeat event next year, why not take the time now to plan a savings strategy so you don't go into debt again? Figure out a target savings goal, either based on how much you spent this year, or the cost of a trip you want to take next year. Then determine how many months you have between now and your vacation. Finally, divide your target savings goal by how many months you have to save, and strive to set that amount aside each month. After all, won't sipping cocktails on the beach be that much sweeter if you're not worrying about facing a debt hangover once you return?